Through a combination of the Ryman Premier’s fixture scheduling and the famous FA Cup balls, the legend that is James Boyes was facing a football-less Saturday a few weeks ago. He dealt with it like a true football-loving man that he is. There was no football on….no game I could go to. But it was Non-League Day. My team, Lewes, were due to play away against Hendon in the Ryman Prem who ground share with Wembley at Vale Farm. However Wembley were drawn against Ardley United in the FA Cup and despite looking at a Friday fixture or a Saturday double-header, the league game was moved to Sunday. So, the choice was mine. I could take the afternoon off, spend it with the family, do some gardening or go shopping. But instead I opted for a trip east to Hastings United. The conversation went something like this: Wife: “So where are you going today?” Me: “I’m going to watch Hastings.” Wife: “So what about Lewes?” Me: “They’re playing at Hendon tomorrow.” Wife: “Oh. So you don’t need to go today?” Me: “Well no”. A period of silence ensued. But it was Non League Day and I felt I needed to ‘be there’ even though I would ‘be there’ the next day too. It was a bit of a busman’s holiday for me at Hastings, although if I’d realised how steep the hills were to the Pilot Field from the station on my bike, I might have asked an actual busman to drop me off. There is a large contingent of ex-Lewes players amongst the ranks at Hastings now (nine of the seventeen players on the team sheet had some Lewes connection) led by the manager Jason Hopkinson who was number 2 at Lewes under Steve Ibbitson. 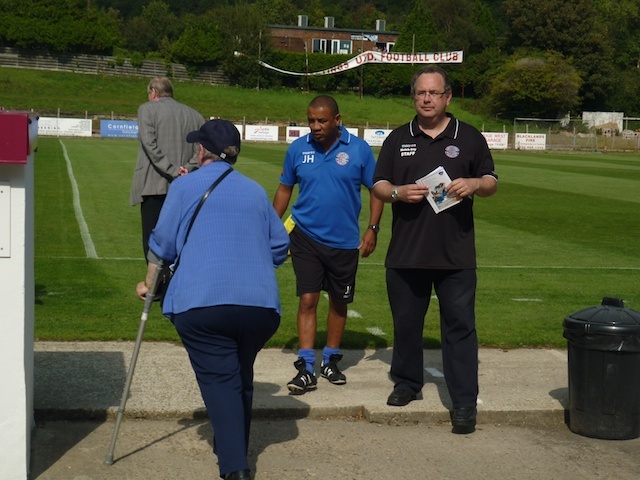 The duo had been involved for some time at the Dripping Pan with the Under 18 set up, but when Kevin Keehan resigned as first team manager in the spring of 2009 following 17 straight defeats in our disastrous Blue Square Premier season, they stepped in to guide the ailing club over the line and back into Blue Square South. Ibbitson and Hopkinson continued at the helm together the following season, steering the Rooks to safety with a last day win at Hampton & Richmond having been in the relegation zone for most of the season. When Ibbitson stood down as manager after a 1-1 draw at Bromley last season, Tim O’Shea took over as manager and Jason intended to stay within the club and get re-involved with the youth set-up. 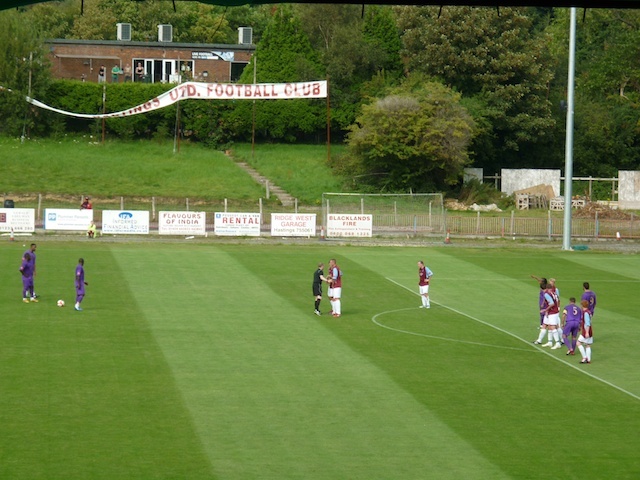 However the opportunity to manage at Hastings arose some weeks later after the resignation of Tony Dolby and Hopkinson moved to the Pilot Field in December. His departure from the Dripping Pan was a sad one for Lewes, having been an ever-present face for six years and making lots of friends during that time with his humour and determined, yet easy-going nature. Like Ibbitson, he was unpaid yet was totally committed to the cause of Lewes. Like Ibbitson, he was also made a Life Member at the club in recognition of their work together and The Great Escape of 2010 TM. Yet the chance at Hastings – and some say the fact that he was denied the chance to take over as Lewes manager with O’Shea’s appointment – saw him leave all that behind. As the new Lewes boss brought in new players, there was a slow departure of familiar Lewes faces to Hastings who were deemed surplus to requirements. Many of the team who in 2008 had played in the defeat to then Premiership Hull City in the first round of the FA Youth Cup have ended up across the county. 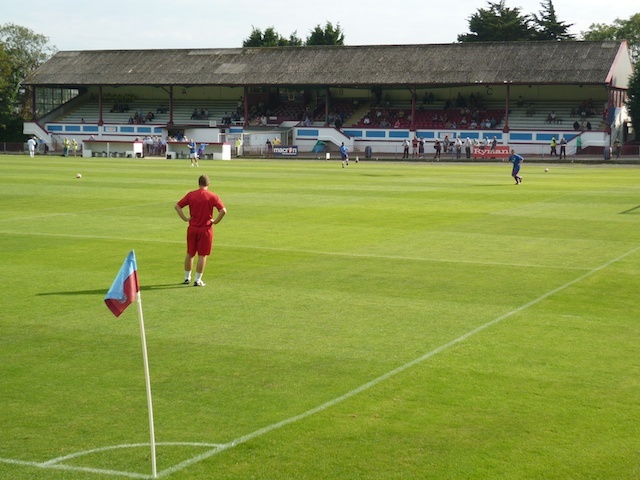 Ross Sutton and Scott Manning were the first to leave, followed by Fred Foreman and others who had previously played on loan for Lewes such as Josh Klein Davies and Josh Jirbandy. The mixture of new players and the existing squad continued to struggle at the wrong end of the table, although form picked up under Hopkinson who gave United a chance to survive that looked a distant prospect when he took over. Hastings had won only four games before his appointment, the latest being the first weekend in October. The losses still continued into the New Year but Hopkinson steadied the ship and the spring brought better results. The bad form returned in the final games of the season though, losing three of their last four games, but United managed to stay up at the expense of Aveley despite a 2-3 reverse there in the last game which condemned the Essex side to Ryman South, although they were subsequently reinstated courtesy of Rushden’s demise from Blue Square Premier. Hopkinson has continued to build over the summer, signing former Lewes favourites in George Jones, Jack Walder and Jamie Crellin, although like so many clubs, United are struggling financially and Hopkinson has said he has only a third of Lewes’s reported annual budget of £125k. 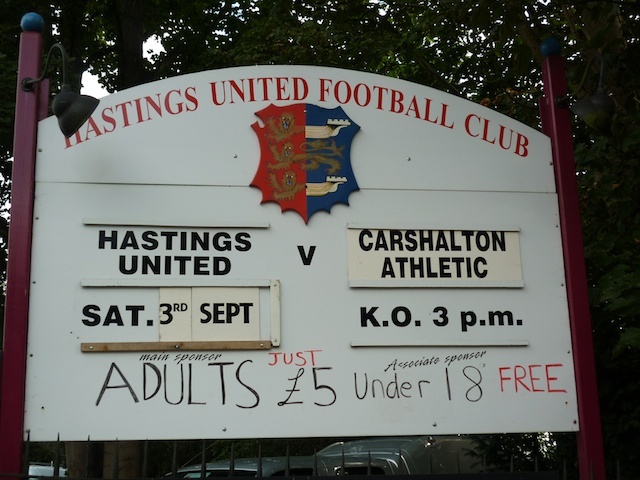 Hastings United 0 Carshalton Athletic 2 – Pilot Field – Saturday 3rd Sept 2011 Hopkinson mentioned in his programme notes that his assistant Adam Hinshelwood would be off to manage Sussex County League side Selsey, partly due to his own circumstances and partly to do with money, which, combined with the move of Wes Tate to Rye, frees up more money for the player’s budget. The Hastings Chairman and Secretary also pointed out in the programme that many teams are becoming concerned about a drop in attendances in the early weeks of the new season with the club having suffered a fall of around 500 over the equivalent period a year ago. 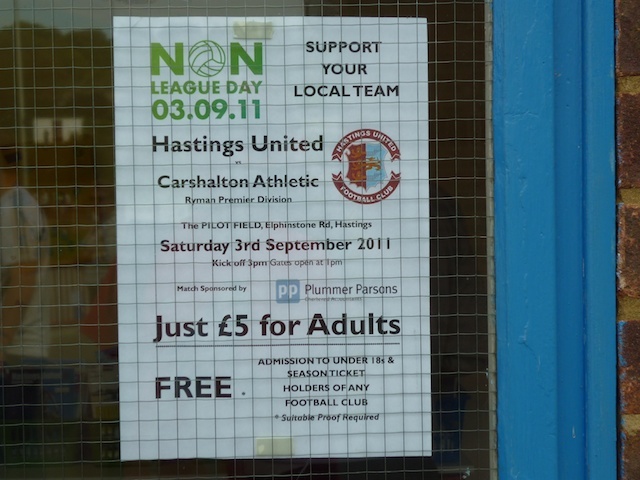 Like a lot of non-league clubs, Hastings halved their prices but very generously offered free entry for season ticket holders of any club, something that not many other clubs seemed prepared to do. It seemed that their bravery was rewarded with a crowd of 431, up considerably on the 297 and 248 from the previous two home games this season. Hopefully some of those will return because considering the size of the town, the people of Hastings ought to do considerably more to support their own club. It wasn’t long until the first goal, as Dean McDonald’s fairly tame 30 yard free kick took a nasty deflection into the top corner to put the visitors ahead. The game looked as if it might get a bit tasty with some unsavoury challenges cropping up from both teams, but it was Carshalton who suffered first when Tom Davies was shown a red for diving in the area moments after being booked for a tackle on Matt Hall. Despite the extra man, Hastings struggled to dent the visitor’s defence, although Aaron Hopkinson should have worked the keeper when clear through, only to fall victim to a fine block from Craig Tanner. Carshalton’s ‘Fiorentina Purple’ shirts had a bit of bling about them with gold numbers, but it was purple of the Deep variety that kept the crowd occupied at half time over the pa, along with ELP, Queen and other 70’s rock gods. It’s unclear which dressing room shared the pa feed, but it was the visitors who came out more inspired in the second half, with McDonald adding a second early on, with the Carshalton supporters not slow to point out that they’d “only got ten men”. Hastings’ best effort came from Fred Foreman whose dipping volley was tipped over by keeper Nick Haman, although their day got worse when Jones had to be taken off on a stretcher in the closing stages. On this showing, Hastings look set for another difficult season although in Hopkinson’s defence, there were a number of first team players missing through injury which doesn’t help at any stage of the season. However, given his record at beating relegation, the manager’s not talking about the R word just yet. James is the website and programme editor for Lewes FC and an all round top chap who told me to say that. You can follow him on Twitter here.